The following is a partial excerpt from the chapter "Giving it a Shot'" from Barry Wensel's new book "The Crooked Hat Chronicles"
The subject of shooting running game is somewhat controversial. I feel compelled to justify my reasoning at that time in my life. 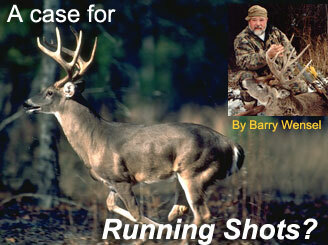 Although I can’t frankly remember the last animal I shot running, I’ve killed dozens of them over the years. Because I literally shot my bow everyday for many years, I honed a knack I’d always possessed. It was an instinct perfected through the timing. I developed quite a bit of my shooting techniques on moving targets while I was fishing. Let me explain. Timing the projectile with the speed of the target (or yourself) dictates your accuracy. During the spring and summer months in Montana I spent a lot of daytime hours fishing. While standing knee or crotch deep in a river one had a constant flow generally going left to right or right to left. There were hundreds of “targets” floating by at any one moment. Insects, bubbles, leaves, sticks, cottonwood molt all gave me moving targets to spit at. Yes… spit at. I especially liked bubbles since a bursting bubble gave me feedback of a direct hit. Back then I used to chew leaf tobacco. The juicy mixture of saliva and tobacco gave me plenty of “ammo” to shoot. For consistent accuracy you had to coordinate the distance, the speed of the water, the size of the target and the windage. I got very good at it. I also used to spit on the cracks of the sidewalk while simply walking down the street. I would purposely vary the distances and my gait. I got very good at that too. My high school years were filled with many autumn afternoons with multiple friends holding brand new drivers licenses, just riding around the countryside with bushels of apples, picked fresh from a local orchard, sitting on the seat next to us. The targets were fence posts, mailboxes, single trees, and street signs (deer crossing signs were real special). The game was to try and vary the vehicle speed in order to upset the throwers timing. I got very good at that also. Would you take a running shot? As mentioned before, I used to live next to a golf course in Montana. I was the hired hit man to rid the course of the pesky ground squirrels that constantly burrowed in the greens and fairways. When the gophers spotted me, they’d run for their holes offering me another valued opportunity to practice running shots. I averaged over fifty shots daily for months at a time for many years. Again, I got very good at it. The whole point is to develop your timing to coordinate the speed of your projectile with the distance and speed of your target. I always shot brightly colored fletching on my arrows so my eye could see both the speed and the path of the arrow. In a nutshell, I could program instinctively, in my mind, how long it would take my colorful arrow to cover the distance from myself to my target in relation to the speed of the animal. This worked especially well with my preferred instinctive shooting style. I didn’t have to pick a particular sight pin and calculate the distances. I did it entirely by “feel” in my mind. I want to stress I don’t advocate everyone shooting at running game. But in the same respect I feel if it’s a practiced technique and you develop consistently successful results while practicing, I don’t think it’s any less ethical than shooting at a stationary target that’s standing still on red alert after it has spotted you. That’s the primary reason I haven’t shot running game in years, because I no longer live on the golf course, nor intentionally practice moving targets. I never kept track but I’ve killed a pile of moving game over the years. 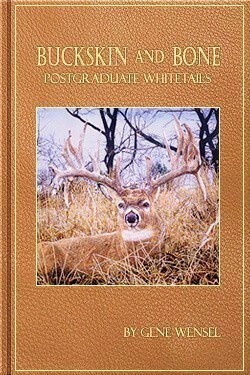 I can think of six whitetail bucks right off hand I shot running on film. 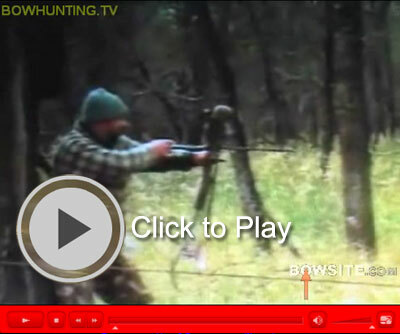 In the original production of our video “Bowhunting October Whitetails” (still available on DVD almost thirty years later at www.brothersofthebow.com) I shot two running bucks on film. I’m not sure if it’s accurate, and I don’t really care, but I’ve been told I was the first bowhunter to shoot a whitetail on production video. I’m talking production video. Today there have been literally thousands of them. In that video everyone seems to remember the buck running from right to left at 22 yards and me lurching my eyebrows in jest immediately after the shot. Then there was the, “I was a good two inches off” quote, all in fun. Apparently that shot was more memorable, although the other buck in that same video, which was running from left to right, was actually a much more difficult/better game shot. Folks tend to think what they view on film as what I was actually seeing. In this case the cameraman was probably fifteen to eighteen yards behind me and to my right. The footage appears like I hit the buck a little too far back, where in reality my arrow angled in from the rear taking out his lungs perfectly. In fact, we had to edit the footage because it was otherwise too bloody to view. Relating to the information I talked about earlier, I always found running shots from left to right easier for me. I believe it was because of my fishing days. Because of the area where I lived and stretches of river I fished more often, I tended to fish and spit at more floating targets going from left to right. Coincidental? Another example of strange things constantly happening to me, I one time shot another whitetail on film that was running right to left. The camera followed the deer as I shot. On reviewing the footage everything was perfect. Then, just before the arrow strikes, the screen goes black for maybe one or two seconds. The best we could figure out was an internal wiring short or glitch within the camera or tape. The camera footage just went blank for those couple rare seconds of footage. We ended up never using the footage. 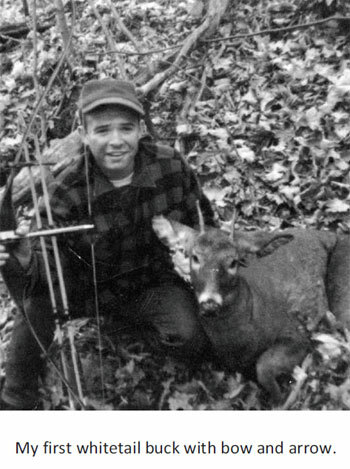 The very first buck I ever killed with a bow and arrow was shot running at 37 yards if I remember correctly. 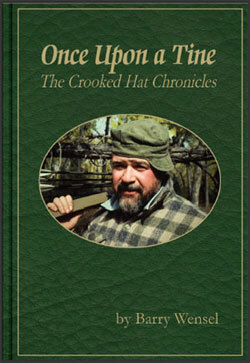 I was hidden in a ground blind on a mountainside near Vershire, Vermont when he came by. He spotted me and broke into a run. My young mind couldn’t accept the fact he was getting away. I swung out in front of him and instinctively let fly with a Bear Razorhead mounted on a powder blue wooden shaft that took him through the heart. I still have the remains of that arrow to this day. Back in 1992 I shot my first javelina in south Texas. Custom bowyer Mike Palmer happened to be just behind me when a group of javies hit my scent stream. They took off, and because I was a javelina virgin, I swung on a big boar and drove a shaft through his lungs. I distinctly remember hearing the cheering from over my shoulder. Mike said, “You actually do that stuff” (the running shots). He was grinning ear to ear, I assume because he thought my previous running shots on video were the results of selective editing or something. My oldest son, Jason, was now a high school student. Working summers helped him buy his first vehicle, a 4 wheel drive Ford Ranger pickup. Although school had just started, Jason was always a good student so I decided to let him take a couple days out of classes for a father/son, long weekend of bowhunting antelope. We drove his new truck over to Jordan, MT. As we drove past the gravel drive going into the ranch house where I’d shot a buck the previous year I noticed a decent buck chasing three or four does just to the north of the east/west driveway. I noticed the buck and several does still chasing up on the hill to the north. They’d also picked up a smaller buck since we first spotted them. There was a line of power poles running up over the horizon and I pointed out the fact they were between the second and third pole for Jason. Checking the wind, Jason tried to stalk in from the west. I positioned myself in some low brush to cover the back door of their possible escape route. Either visually or due to a swirling breeze, the prairie goats busted Jason. The bigger buck broke from the pack and headed by me going full speed. I swung on him. It felt good and I let her fly. The arrow entered just behind the left shoulder putting him down in short order. The rancher walked up behind me. 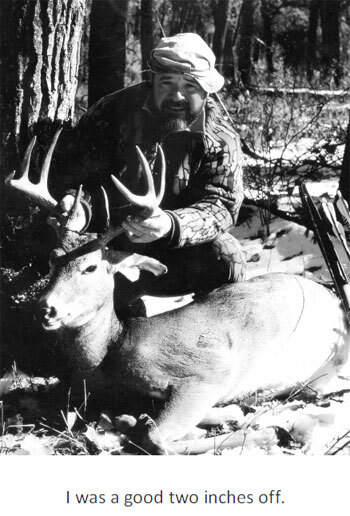 He said (and I’ll quote), “Damn… I never saw anything like that.” He confessed to the fact he gave us permission to hunt because he thought we’d never, ever actually get one. So the fact remains, I actually hunted that property for a total of about twenty minutes in two years and killed two nice pronghorn bucks. Spot and stalk antelope hunting with the bow is a lot of fun. 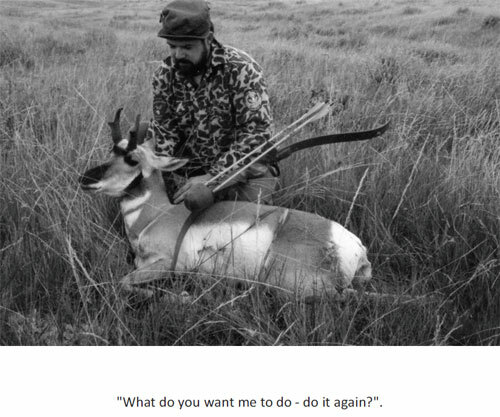 A few years later while hunting the same area we were trying to film shooting a pronghorn on video. Gene and I hunted quite a few days with no luck. We were frustrated in that something would go wrong at the very last minute. On the last afternoon of our hunt we were walking back to the truck totally unaware there were three young bucks just over the hill from us. At the time I was shooting a custom one piece Schafer Silvertip recurve bow pulling 74 lbs. at 28 inches. I purposely was shooting solid yellow wooden shafts fletched with three yellow feathers. The idea was to be able to better see the arrow in flight on film. I had to swing out in front of the lead buck quite a ways since this was North America’s fastest game animal running full speed. When I released the shaft I watched as the solid yellow arrow appeared to be going a little low. My windage estimation was fine but my elevation was off. Fully expecting a clean miss I was shocked to watch the buck tumble head over heels. What I’m about to explain is very hard to believe, but I swear to God it happened, plus the fact I had two witnesses. 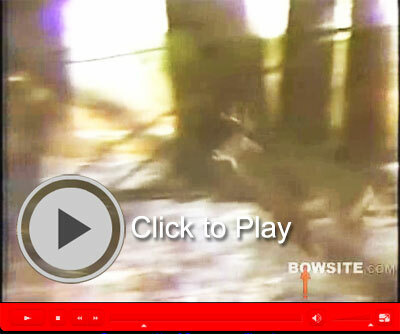 It seems when an antelope is running at full speed their back legs overlap the front legs. When the arrow struck, three of his four legs were in perfect alignment and I literally broke the shaft of all three leg bones with a single arrow. When you get ‘em down to one leg they ain’t gonna get away. As I stated in the beginning, shooting running shots is somewhat controversial and I don’t personally practice it anymore. But, if you practice to the degree you’re confident in your shooting ability and choose your shots determined on the distance and animal’s gait, it’s acceptable in my opinion. BUT, one needs to be honest with themselves for that split second before you drop the string. Signed copies of both Gene and Barry's new books are available to Bowsite.com and Stickbow.com Visitors!